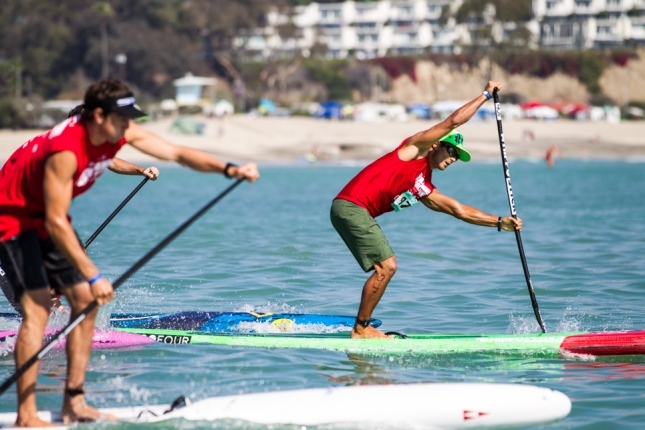 Pacific Paddle Games: The big names looked quick in today’s qualifiers (day one results). Day one of the 2017 Pacific Paddle Games presented by Salt Life certainly delivered. The men’s quarter-finals delivered four back-to-back-to-stacked heats that saw big names rise, top prospects fall and young guns flex their muscles. But in the end it was the superstars that owned the day, with Danny Ching, Casper Steinfath, Annabel Anderson and Candice Appleby winning their respective heats along with two guys that are looking very serious threats: Trevor Tunnington and Lincoln Dews. Travis also looked good. Shae has returned from injury in fine form. Georges, Connor, Jade, Olivia, Fiona, Boothy, Mo and the Hasulyo Bros all got things done with minimal fuss, while Titou slipped under the radar with a characteristically understated performance. And those were just some of the other stand out stand up performers. It’s going to be mighty tough picking a winner on Sunday. But while finding the winning name is a lottery these days, one of the (slightly) easier themes to settle on is youth vs experience. So can the established world order seal the deal on finals day? Or will the next generation steal the crown? Watch Sunday’s live stream and be the first to find out. If today’s qualifiers were any indication, it’s going to be a cracking finale out there tomorrow. What else did we notice today? For one, the depth of talent in the men’s field is getting intense. There were no easy spots through to the semis, as several well-known names got bundled out in the quarter-finals. Secondly, there’s a very strong international presence at the PPGs this year. There always is, but the global vibe seems to have gone up a notch in 2017. The Tahitians are everywhere. There are dozens of Aussies roaming the beach. The French crew are rolling seriously deep these days, while the tiny Spanish island of Mallorca brought over a whole stack of juniors that mixed it with the local kids. It was great to see. Speaking of the kids, Saturday also gave centre stage to the ‘Super Groms’ as well as the open paddlers, something organisers went out of their way to emphasise this year. And rightfully so. The weekend warriors are the true foundation of our sport, while the super groms are the future (and in many ways, they’re the now). So it makes sense to give them some of the spotlight alongside the famous faces in the pro races. Dozens of kids from across the U.S. and around the world put on a show that suggests our sport’s future is bright, while the weekend warriors also hammered it out for pride, glory and some serious bragging rights. And almost every single of them crossed the line with a huge smile. It was the kind of thing that could renew one’s faith in the sport. 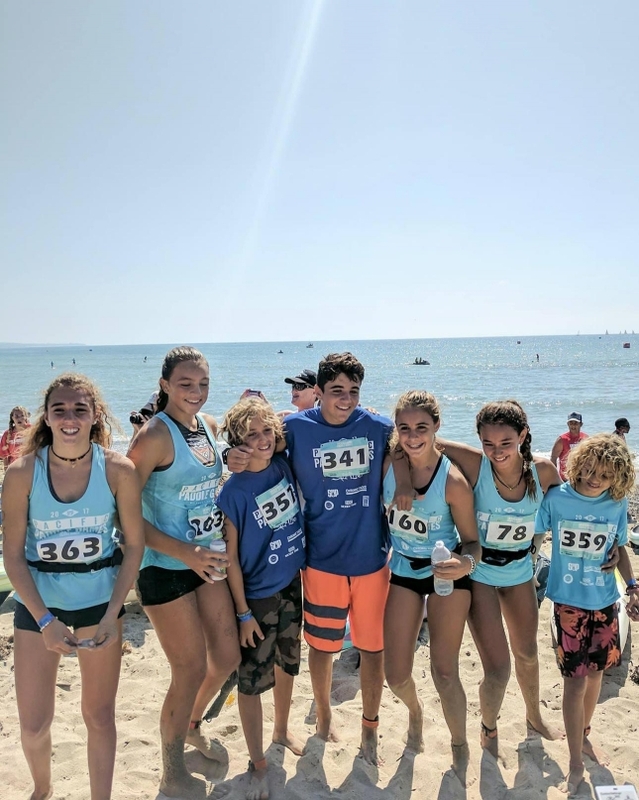 The Grom Race champions included Shuri Araki (boys 11 & under) and Rai Taguchi (boys 12-14) from Japan, Malaya Ring (girls 11 & under) from the USA, and girls’ 12-14 winner Sonia Caimari — one of the many kids representing the Spanish island of Mallorca. On Sunday we’ll see the 15-17 year old Pro Junior kids in action. After a big open field took to the water just before lunch, the top finishers were rewarded with a special ‘Open Beach Race’ grand finale to close out day one where Brian Meyer and Jennie Sandvig saluted. Catch up on everything else that happened with SUP the Mag’s day one recap. We’ll be back on air at 8:30am Sunday for the distance race (this will be a more basic broadcast direct from the boat) before the finals start at 12 noon (full broadcast). As always, the webcast will be piping through live on SUP the Mag’s Facebook page. More coverage on the official site and SUP the Mag’s Facebook page. And you can click here to see the full results from all races and divisions. See the full results from the kids races, and click click here to get the full results from all races and divisions.